Definition: Cost Sheet, as the name signifies, is a periodical statement that reflects a detailed overview of the cost incurred on various components during the process of production. It is used to determine the cost of a cost object, i.e. product, service, or a cost unit. Cost Sheet helps in the classification and analysis of the cost components of a product or service. The elements of cost are classified on the functional basis. However, it can be classified on another basis too, as per the requirements of the firm. Prime Cost: Prime Cost, refers to the total direct cost involved in the production process. It includes direct material cost, direct labour cost and direct expenses. The direct material cost represents the total direct material consumed. Direct labour cost, represents the wages, salaries, bonus, overtime pay, allowances and incentives, paid to the workers and production manager. Direct Expenses takes into account all the expenses such as rent paid for using machinery, the royalty paid for the provision of service etc. 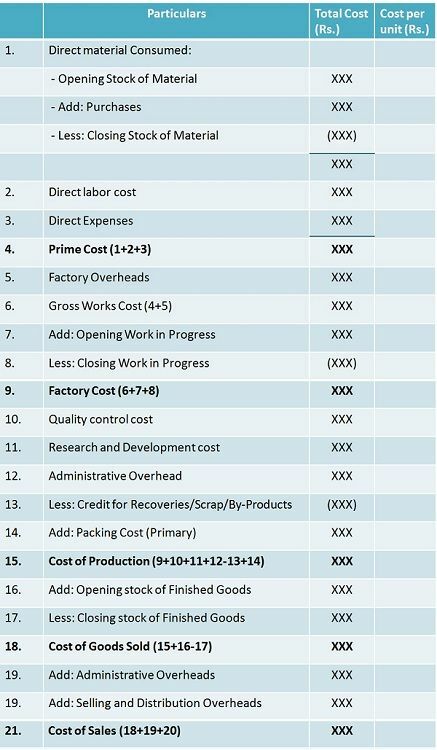 Factory Cost: Otherwise called as works cost is an aggregate of prime cost and factory or works overheads. Factory overheads include indirect material, indirect wages and indirect expenses. Adjustment for opening and closing work in progress is also made to compute the net factory cost. Work in progress refers to the units that remain incomplete at the end of the period. Cost of Production: As it is evident from the name, cost of production, implies the total cost incurred in the process of production, which includes quality control cost, research and development cost, administrative overheads, packing cost etc. All these items included in the process of production must be related to the process only. Cost of Goods Sold: After arriving at the cost of production, adjustments are made for opening and closing stock of finished goods, which results in the cost of goods sold. Cost of Sales: Cost of Sales denotes the total cost incurred by the entity to make the product available for sale to the customer. It takes into account the cost of goods sold, administrative overheads, selling and distribution expenses. Cost sheet provides a snapshot of the total cost and per unit cost involved in the production. It helps in the comparison of costs, between current and previous year, as well as between estimated costs and actual costs. For the submission of tenders, cost sheet is primarily used to ascertain the total cost expected to be incurred on a project.